Love them or hate them but you’ll see them everywhere around the globe. Christmas decoration isn’t necessarily good looking or stylish but that’s not the point of the holidays anyway, is it? 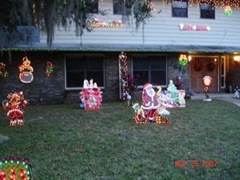 So there’s a blog dedicated to tacky Christmas yards and it is exactly what the title says, lots of tacky christmas yards. This entry was posted on Tuesday, December 18th, 2007 at 10:45 pm	and is filed under Seasonal/Holidays. You can follow any responses to this entry through the RSS 2.0 feed. You can skip to the end and leave a response. Pinging is currently not allowed.